In behavioral healthcare, the goal is to get patients out of their rooms and into interactive, social environments. Physically ill patients need to primarily be in bed to heal but behavioral / psychological health patients need to be encouraged to come out of their rooms and engage in shared spaces. So how do you design common areas and day spaces to promote social engagement? Make common spaces inviting with comfortable, casual furniture. Consider using fully upholstered furniture to create functional areas where patients can engage in therapies, conversations with healthcare professionals, read, journal, etc. To get the most of your furniture dollars, be sure to use contract-grade furniture that will stand up to heavy use. 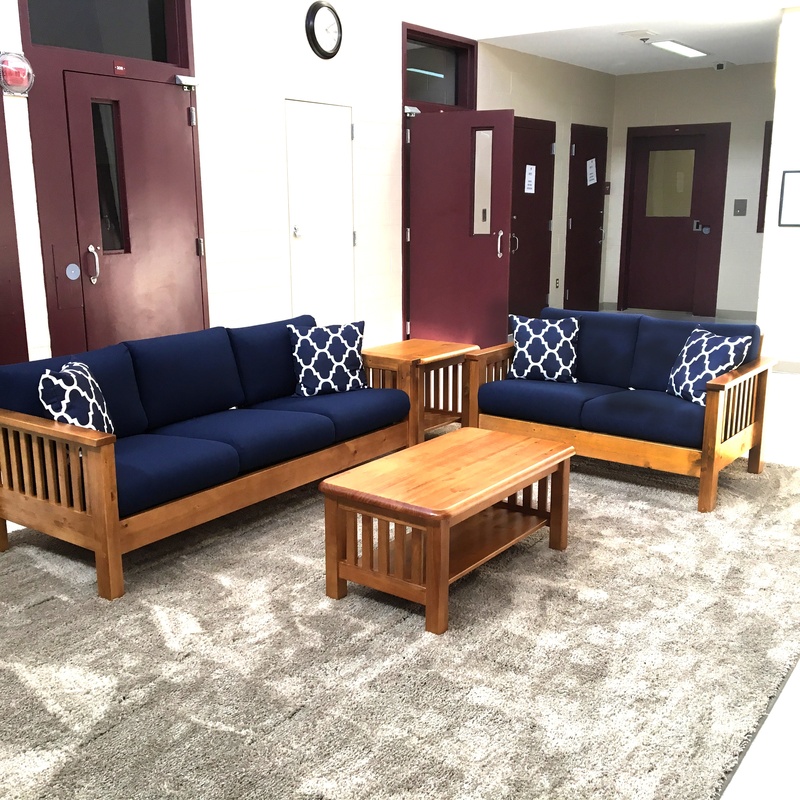 If destructive behaviors or psychiatric outbursts are a concern there are a wide variety of furnishing options ranging from highly durable upholstered seating to molded plastic seating that can be weighted or bolted to protect patients and staff. Experienced contract furniture providers who specialize in BHC can recommend the right pieces of furniture that will balance the need for home-like comfort with the safety and durability required of high-risk behavioral patients. Keep shared spaces geared towards quiet activities by providing game tables or functional workspaces, not distracting television areas or other loud spaces. While comfortable seating invites patients to engage in therapies and reading or other quiet pleasures, adding game tables or work tables where patients can use art therapies or project work adds functionality. Having game and work tables incorporated in common spaces not only encourages patients to engage outside their rooms but also helps staff because patients are within general visual range. Game-top tables with checker / chess boards laminated to the top are a great way to have activities at the ready and encourage patient engagement without the need to store boxed game boards. Consider the age and other health concerns of patients to create spaces that are relatable and encourage comfort. Elderly patient populations may have different expectations of comfort then younger patients. Older patients may find more comfort in traditional styling and color schemes whereas younger patients may find more contemporary styles and color schemes more appealing. If serving a cross-generational population, consider neutral colors and furniture with more “transitional” styling. Transitional styling combines elements of both traditional and more modern sensibilities to create a furniture designs that includes fewer curves and a more traditional scale. Comfort and function of furniture are important considerations. Furniture form or style is typically a primary consideration because the look of a space has to encourage patient use, but functionality is also important. Elderly and limited mobility patients might need additional considerations such as furniture designed for incontinence or ease of moving from sitting to standing positions. Patients weighing over 250 pounds might need bariatric considerations. High risk behavior patients might need additional safety and security features. When designing your BHC’s commonspaces there are many important considerations. Encouraging patients to leave their rooms to engage with staff, family and other patients are critical components in healing. Finding the right balance of furnishings that meets the needs of the consumers while fitting into an overall functional design can be challenging. It is always important to involve an experience design team who can make recommendations that fit the needs of your patient population.